Republican John McCain called Thursday for a federal investigation into plans by the DHL shipping company that could cost 10,000 jobs here, as he and his campaign manager took criticism for helping DHL complete a key corporate merger in 2003. With Democrats and labor groups blaming McCain and his campaign manager Rick Davis for their role in the threat to local jobs, McCain moved to demonstrate his concern about possible job losses in this critical swing state that gave President Bush the electoral votes needed for re-election in 2004. The Republican presidential candidate called on the Justice Department to begin an antitrust investigation into DHL's plans to puts its packages aboard the planes of a rival, United Parcel Service, before delivering them in DHL trucks. Because UPS flies out of Louisville, Ky., the plans call for shutting the DHL shipping hub here that uses the Wilmington airport and eliminating up to 10,000 jobs. McCain met with elected officials and residents of the southwest Ohio city to discuss the DHL plans. "I can't assure you that this train wreck isn't going to happen, but I will do everything in my power to see that we avert it," McCain told the group. "Should this happen, DHL will cede significant elements of cost and quality to one of its chief competitors. 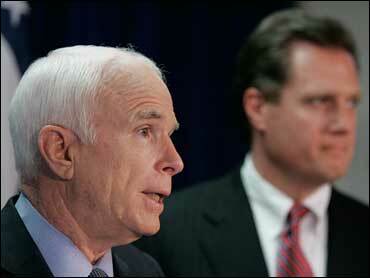 Consumers all over America would suffer," McCain told reporters later. He said Congress may need to intervene and, if DHL is allowed to proceed, he would like to see a rapid response to help displaced workers and to try to attract other commercial development at the Wilmington site. Since The (Cleveland) Plain Dealer broke the story, Democrats and labor groups have been eagerly pointing out that five years ago McCain and Davis aided German-owned DHL in completing its purchase of U.S.-owned competitor Airborne Express, which had long operated the Wilmington shipping hub. During a campaign visit last month, Democratic presidential candidate Barack Obama met with Wilmington Mayor David Raizk to pledge his help if elected. In 2003, McCain, as chairman of the Senate Commerce Committee urged then-Senate Appropriations Committee Chairman Ted Stevens to abandon a proposed bill to prohibit foreign-owned carriers from flying U.S. military equipment or troops. Airborne Express said the bill was aimed at torpedoing its merger with DHL, the U.S.-based shipping unit of German postal service Deutsche Post AG. At the same time, when he was a lobbyist, Davis helped persuade Congress to accept the merger. Davis took a leave of absence from his lobbying practice to work for McCain. A campaign spokesman said Davis had not worked with DHL since 2005, long before DHL announced plans to move its work out of Wilmington. Earlier Thursday, McCain, who has contended that Obama is willing to lose in Iraq to win the election, said his rival would forfeit the war as part of an agenda that also promotes big government and high taxes. McCain told those gathered for a town hall meeting in Lima, in northwest Ohio, that Obama is a talented orator with an agenda that could be boiled down to simple policies the Arizona Republican opposes. "Government is too big, he wants to grow it. Taxes are to high, he wants to raise them," McCain said during the meeting. "Congress spends too much and he proposes more. We need more energy and he's against producing it. We're finally winning in Iraq, and he wants to forfeit." McCain later spoke at a campaign fundraiser in Cincinnati attended by Rob Portman, a former Ohio congressman believed to be on the short list of potential McCain running mates.